THIS bizarre video footage appears to have captured an unidentified object speeding through the region’s skies at night. 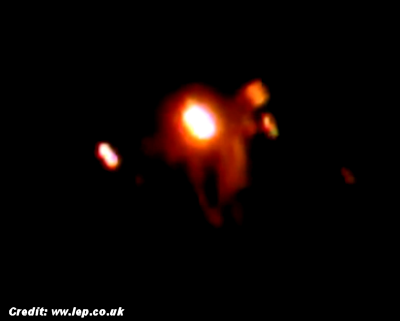 George Hunter spotted unusual lights darting across the night sky near his home in Rainford. He was baffled by the object but is convinced it was NOT a commercial aircraft. Mr Hunter said: “I went out last Friday to see a friend, I got back home and was making a coffee, the time was just after midnight. It was through the kitchen window that I saw some very bright lights in a triangular formation, I went outside into the back garden and saw some very bright orange lights in a triangular pattern, no noise or movement, quiet high in the night sky. “I filmed the lights and zoomed in on them, but only managed to get a short clip on my phone, as the lights suddenly shot off whilst I was filming them, very fast, and gone in less than a second. It was almost like something out of Star Trek moving at warp speed, I have never seen anything move that fast. . . .